“Team SLB started to arrive in Torridon on the afternoon of Monday 22nd to prepare & carry out our final preparations for Celtman -Scottish Extreme Triathlon. The purpose for arriving a week early was to simply allow us all to settle in, relax and start to tune in to our forthcoming race. We hired Val’s amazing cottage called Kathleen’s Croft, situated in a small hamlet of Annat, by Torridon. Probably the cosiest cottage I’ve ever stayed in, this quickly became Team SLB base for race week. Upon arrival the views of the Loch & mountains is simply breath taking. Race Registration at Torridon Village hall. Both Big Seb & I arrived in the village hall to get our kit checked before I was allowed to register! We stood in the queue and waited to be called forward to have our kit inspected by the race marshals. We were called forward and the marshal looked at me & asked- “Are you the athlete? “ As he stared at my 6ft 4 slim fit pal that looked like all the other Danish & Norwegian athletes in the hall ! My reply was simply “yes” he’s my tall support! On Race Day my Alarm goes off at 0200hrs -it needn’t bother as I never sleep before a big race. The lack of sleep on your last night doesn’t hinder you in anyway- you’re pumped, you have trained for months, and more important you’re ready. Time to have fun! Simple race day breakfast consists of Beetroot juice, white toast & jam, 2 cups of coffee, 1 x banana plus 2 salt tablets,500ml of energy drink plus one gel 20minutes before the swim start! We received our GPS trackers and racked our bikes, nerves are kicking in big time, we have been asked by the race marshals to quickly make our way to the buses ready to depart! Upon arrival to the swim start, (a 3.8km sea race), my mouth has become dry, my heart rate is pumping, and I’m totally feeling it. The swim start warm up area is a large grass field lined with burning lanterns, Highland drummers banging their drums to the beat of everyone’s hearts, Huge Celtman Iron Symbols are set alight. What an atmosphere! During the swim I took in some salty water that caused me to throw up while swimming. This is a first for me and also managed to get some cramp in my left calf- again a first. I ignored the cramp and as I thought it went away, I relaxed into the swim and set about a steady pace. No loops just swim around a couple of islands and then head for Sheildaig. The swim exit came into view, time to really up the kick to get blood into the legs. We are now swimming against the tide & swimming through thousands of jelly fish we don’t care I can see the flames and the swim exit! I’m now off on a long 202km bike through the Scottish Highlands. Wacky Wacky races! No aid stations, only self-support. Each competitor has their own vehicle support! If you can imagine 240 athletes plus 240 individual support vehicles scattered all over the Scottish Highlands it soon turns into the wacky races each support vehicle going ahead of their rider trying to find a suitable place to park and then re- fuel their rider as they make their way around the 202km course. The course was 202km of breath taking scenery. It involved climbing over 2500m throughout the day, it had some amazing descents and the last 40km from Garve towards T2 was straight into a head wind! Brutal, however we all had to grin and bear it! No one escaped this headwind. To give you an idea how mentally tough the last 40km on the bike was-My speed dropped to 14kmph, on the small chain ring- going downhill! Normally you would like to be doing 3 times that speed using the slight downhill to your advantage. Anyway I’ve done 100km of it and feeling good, the weather is perfect. Meanwhile my support Big Seb is leap frogging me as we continue to chew up the miles. We worked out a simple system of him taping a gel/energy bar to one of my bottles as I rode past! Everything is going to plan, I have been sick a couple of times and asked Seb for a sickness pill, this is possibly down to me taking in some salt water during my swim. Last 15km, again it’s tough. My mind is starting to think about the run! 5km to ride I start to pick up I can start turning a bigger gear. Again heart pumping I’m steered into the finish to a wall of noise of encouraging supporters. 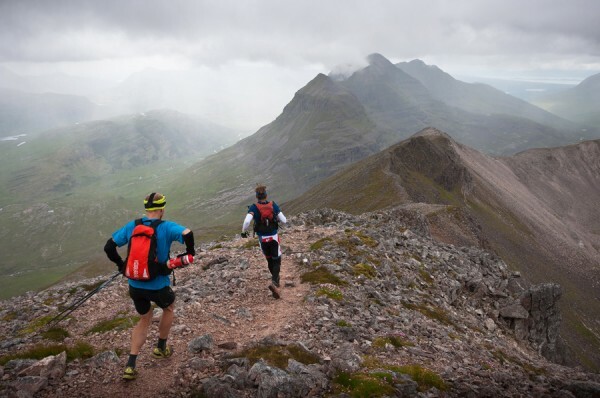 The Final Hurdle- The Run – 42 km over two Munros. I’m now off and running the start of my mountain marathon over the Coullin Pass and I honestly feel great! I see runners slightly ahead & feel like I’m back in charge. The weather was magic I have sun in my face, perfect for topping up my tan! As you all know it’s so important to look good in photos!!! We hit the first Summit. I remember hearing briefs that the mountain rescue will be playing his bag pipes at the top! Seb asked him Why he wasn’t playing? He was puffed out! Ironic “He was puffed out” I was too! Once on the Ridge I could see the most spectacular scenery in the world and instantly thought of taking a race selfie! The ridge was mental, I had to concentrate; the stones are sharp and the steep sides means a fall equals death! I had to take my time. I’m getting tired and don’t want to cream in at this stage! Munroe 2 done, we have a vertical chute to go down; no issues about 300m of climbing down then about 300m of scree then downhill to the tarmac! We both ran over the finish line and both awarded with a bottle of beer! Thank you for letting us having your cottage in Annat. We had a wonderful time and we all thought it was the nicest holiday cottage we had ever stayed in. We really enjoyed our stay at Kathleen's Croft. The cottage is very well equipped, extremely cosy (with plentiful hot water) and has amazing views out onto the loch and the mountains. There is a pub and also a shop close by and lots of walks in the local area. We would definitely love to come back. Thanks." We have had a lovely stay at Kathleen's Croft. Very cosy and warm. Very grateful for the wonderful Christmas decorations and little treats. We have stayed at other cottages locally but this one is BY FAR the best. Thank you very much, we will definitely be back in the spring/summer." This was my second trip to Scotland and my very first to the northern highlands. Torridon is a truly, remote and beautiful area surrounded by incredible scenery. Kathleen's Croft was everything we expected, cosy, warm and tastefully furnished. The welcome gift of wine and biscuits was very much appreciated. Every window offered views to the Loch and mountains and my son soon occupied the little viewing area upstairs which he called his office. A place to download photos every night. I was hoping to light the log burners but alas it wasn't cold enough ha ha. We loved Shieldaig where we enjoyed lunch at Nannys. This was the area where we saw our only sighting of Sea Eagles as well as seals. Despite the unpredictable weather we managed to walk everyday. The most memorable walk was to the Triple Buttress, a fine low level walk offering breathtaking views. Tesco delivered our weekly supplies which was ideal as not everything can be purchased locally. We did however buy a number of items from the Torridon stores whilst enjoying their cafe. Not too many places to eat locally unless we wanted to drive a few miles so apart from a meal at the Torridon, not the posh restaurant and several lunches taken elsewhere, we ate in the cottage. Our experiences of this part of Scotland will always remain with us and we hope to come back again in the future despite travelling over 700 miles to get here. It was worth it!!! Thank you Val." We absolutely loved your cottage....wonderful style, great taste and perfect location.Seeing a stag just outside the front garden in breaking dawn was a highlight...made more exciting when a pine martin ran across your wall...I thought I was dreaming." We really enjoyed our stay and the cottage is as always cosy and homely place to stay, what a lovely location and views." Thank you very much for a fantastic week in your beautiful cottage. We have been to Torridon many times and it was a lovely place to enjoy it from. It was very homely and we were able to totally relax and enjoy this beautiful setting. " A brief note to say a very large thank you for Kathleen's Croft. A superb cottage and immaculately presented, please pass our thanks to Lisa; and of course in an absolutely brilliant setting with views across the Loch, herons, mountains that beckon - and an easy walk to the pub. We had the full menu (!) of late March weather but still managed 3 mountains days, one coastal bog trot and 2 days as tourists....so back to work for a rest! Many thanks." I'm so pleased Kathleen's croft is available. It is by far the best cottage we've stayed in at Torridon. Roll on the summer holidays and thanks Val"
Returned to this truly idyllic cottage in October - yet again blessed with glorious weather all week. This has become our favourite place to be - the perfect mixture of a wonderful warm and welcoming cottage with stunning scenery, walks, wildlife and food (our christmas smoked trout came from the Applecross Smokery!). We will be back!" A very comfortable old and quaint cottage near Torridon village that is very quiet, has all the modern amenities including wi-fi for those of us who want to keep in touch, great self-catering facilities, good eating out restaurants in the area and has loch fishing, both sea and fresh water close by. Superb walks and mountain climbing all around." Once again a wonderful stay. Fantastic walks, fabulous food both at home and out, all in a beautiful location. The weather was on our side and we couldn't have had a better week in which to celebrate our 1st Wedding Anniversary. Thank you"
The Cottage was great; a great place to spend the week. The location really suited what we wanted to do on our visit also. We had a fantastic time! Many thanks. Kathleen's Croft is just perfect. It is a beautifully situated house, tastefully decorated in Val's inimitable style. Fabulous walks, fishing and food all around - what more could we ask for? Cannot wait to return in October. Just a quick note to let you know we had a wonderful time at Kathleen's Croft. The cottage is beautiful and very comfortable. We both found it very relaxing sitting by the fire with a gin and tonic after walking, exploring or taking a seaplane over Skye! We will definitely be back. Love the cosy warm cottage, great views, great walks, great everything. Can't fault it. We don't want to go home!" I would like to say a huge thanks again. Both Linda and I had an amazing stay in Kathleen’s croft over the weekend - as soon as we arrived we felt so at home. The cottage and the local area is just stunning. The footpath directly behind the cottage is just amazing.I’m already looking forward in returning in June". We had a wonderful break and arriving in the dark with cold wind and rain it was so nice to find such a cosy welcoming cottage especially with all the extra christmas touches too - all very much appreciated, thank you!! Kathleen's Croft is beautiful and well equipped."